We just finished watching the season premier of Suits and what did we see but a commercial reminding us that Sonic shakes are half price all day tomorrow, June 20th. You know, Sonic opens at 6 a.m..... I wonder if I could get one for breakfast? To make sure you are excited for tomorrow, Sonic has shared a little gift card love with us. There's a $20 gift card in it for me (we haven't been there since we tried the Sundae Shakes) and then there's a $20 gift card for one lucky winner. To make my life easy, we're going to make this a facebook contest again. 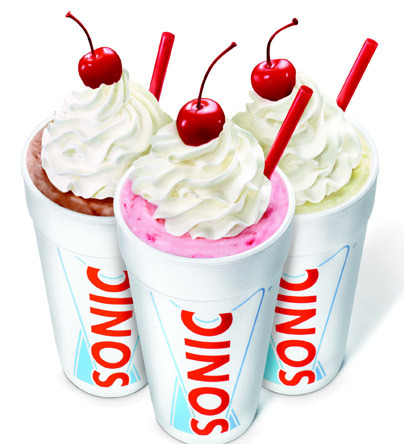 Go over to the second scoop facebook page and leave a comment on the Sonic Shake post. I'll let the contest run for a few days and then we'll pick a winner. Update: Thea London is our winner! Congrats! Sorry, got a little backlogged from the mini-vacation!